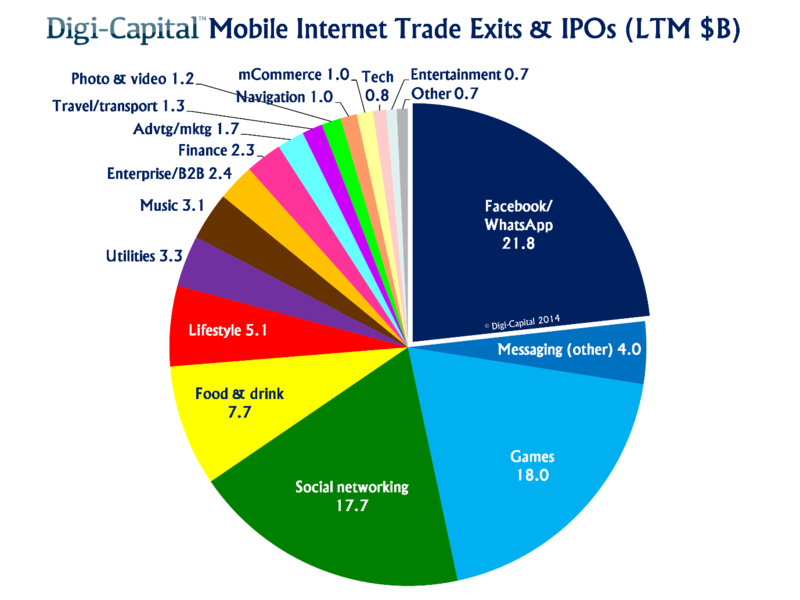 The Mobile Internet sector is proving to be one of the hottest sectors of growth in the tech industry. Whilst the exit of WhatsApp to Facebook is the most obvious manifestation of this upwards trend, new data from Digi Capital shows that this is merely the (impressively large) tip of the iceberg. The data released in Digi Capital’s report shows an astonishing leap from $9.3B in exit returns 2 years ago, to $13.7B the next year, to $93.7B in the last 12 months. This last jump represents a leap of almost 7x growth from the previous year, helping to show the enormous potential in this sector. The hottest sectors within mobile internet were Messaging, Games and Social Networking. 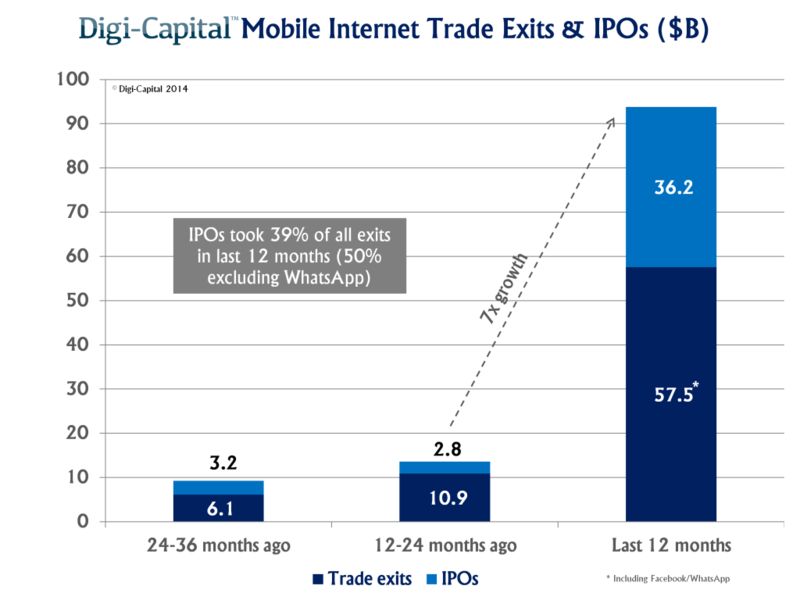 The Messaging sector saw the highest exit returns, with $25.8B, although Facebook’s acquisition of WhatsApp was responsible for $21.8B of that. The Games sector saw the next highest, with $18B in exit returns, and without the outlier of the WhatsApp acquisition, that makes it the strongest sector, closely followed by Social Networking which saw $17.7B in returns. As the below graph shows, 2 other sectors, Food & Drink and Lifestyle also made over $5B in exit returns, as well as another 9 sectors returning over $1B, showing that the current growth is spread between different sectors, and not just focussed on a few. Multi-Billion dollar exits are obviously good headlines, but the VC and growth equity investors are more interested in the exit returns. Rather than purely looking at how many dollars are received, the important figures are the amount of dollars returned for every dollar invested. 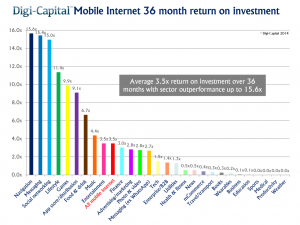 As the report states, early stage investors typically hold on to their investments for at least 3 years, and the 3 year average return on investment for mobile internet up to q3 2014 was 3.5x. As the below growth shows, however, in a number of sectors, including the aforementioned Messaging, social networking and Games areas, growth far exceeded this average. 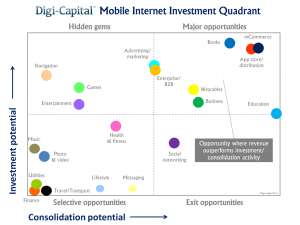 Digi-Capital’s report ends with a quote from the Managing director of Digi-Capital, Tim Merel, which forecasts further good news for those investing in, or creating Mobile Internet companies. 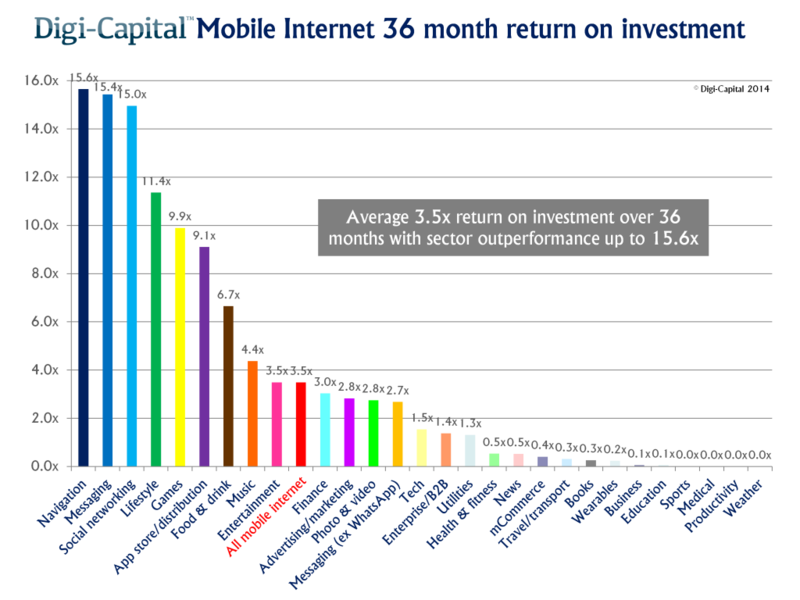 According to Merel, Digi-Capital’s analysis indicates that “the next 12 months could be even more rewarding”. 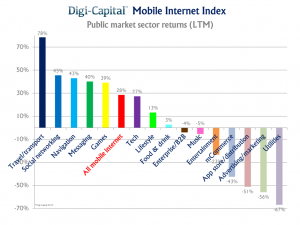 Further analysis shows that Institutional investors have been rewarded for their faith in mobile internet, with Digi-Capitals Mobile Internet index of 78 public companies in and around mobile internet giving an average 28% return in the last 12 months. 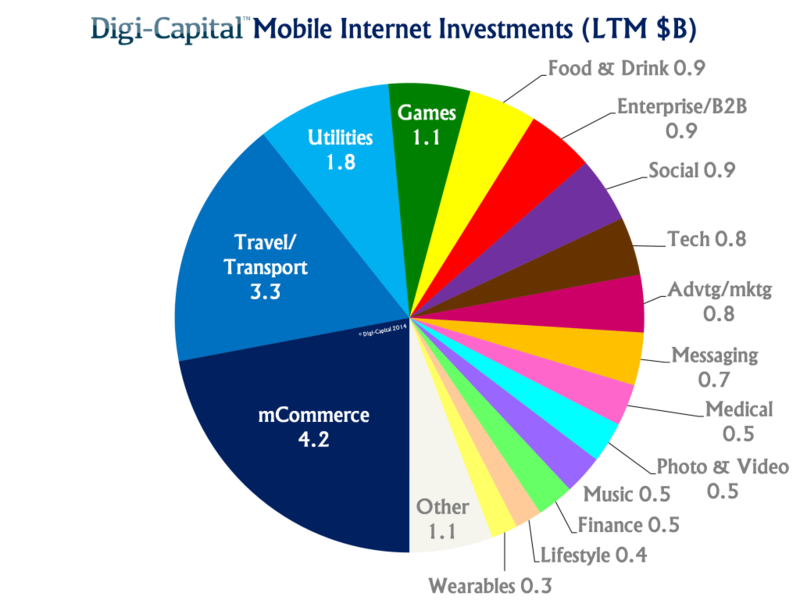 The graph below shows that there has been especially strong returns in the travel/transport, social networking, messaging and gaming sectors.ly evenly, rather than in one specific direction. 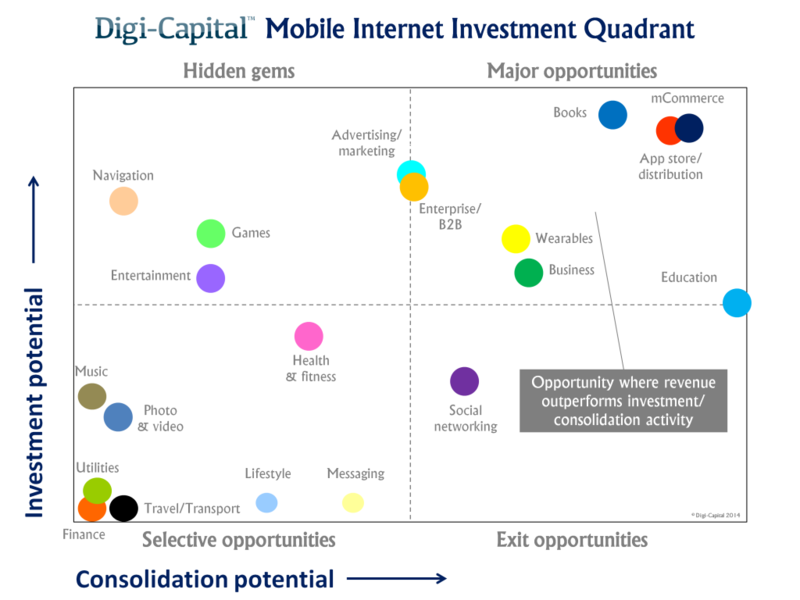 Digi-Capital have also created a quadrant highlighting opportunities where revenue outperforms investment/consolidation activity. According to the graph, there are major opportunities in mCommerce, Appstore/ Distribution, Advertising/Marketing, Enterprise/B2B, Wearables, Business, Eduication and Books. Hidden gems include Navigation, Games and Entertainment, and there are exit opportunities in Social Networking. Selective opportunities are also available in Health & Fitness, Music, Photo & Video, Messaging, Lifestyle, Travel/Transport, Utilites and Finance. This shows that throughout the varying segments in the sector, there are possibilities to make good investments, rather than one sector more obviously dominating. This can only be good news for the Mobile Internet sector. 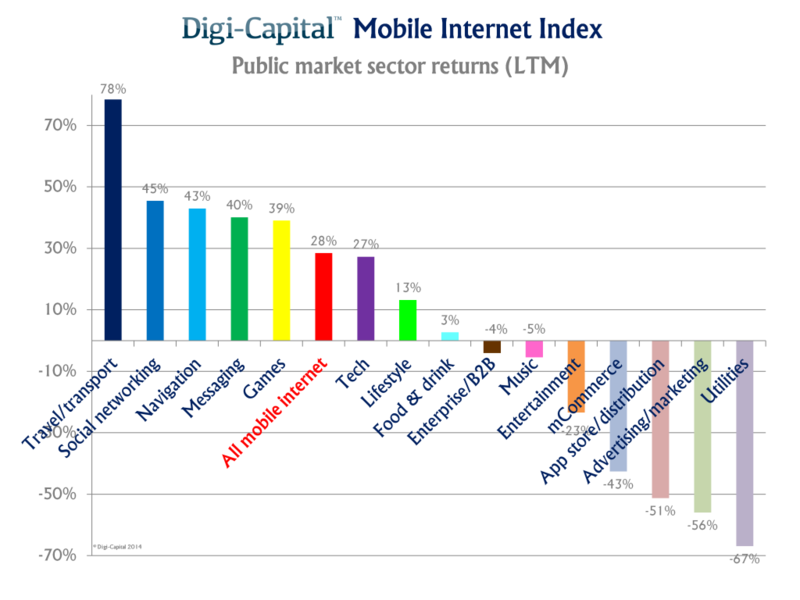 Tim Merel, the Managing Director of Digi-Capital, sums up this positivity around the Mobile Internet sector by pointing out that “There have been lots of big numbers already, but for Mobile Internet investors the best is yet to come”. Styloko have announced the appointment of a new Chief Executive, the former ShopStyle Managing Director, Shannon Edwards. Edwards has a strong background in the online fashion retail space, having joined ShopStyle in 2008 and launched the business in the UK, followed by France and Germany in 2009. Under her leadership, ShopStyle grew the customer base to more than two million monthly unique users, with over 3,000 fashion brands and retailers. Prior to that, Edwards was a director at eBay’s Shopping.com, where she led the sales and communication teams across the US and EU in San Francisco and London. Styloko have gained a Chief executive with a wealth of global experience, and a great track record of success. Edwards will help Styloko to grow the business globally, and strengthen and forge relationships with retailers. The Forsyth Group assisted Styloko with this search, and Shannon is the third executive we have placed with the company.